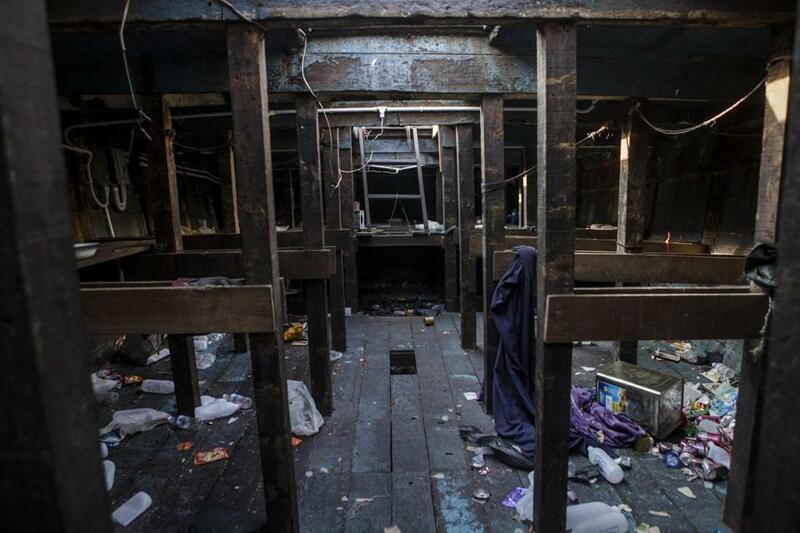 The hold of an abandoned boat, which carried Rohingya and Bangladeshi migrants, sat empty in May in Aceh Province, Indonesia. The tens of thousands of migrants around the world who are frantic enough to take unsafe boats or sit atop fast-moving trains to get to Europe or America are telling us something vital about the global economy. But officials here and abroad don’t want to hear their mournful lesson. The flows of migrants across the Mediterranean prompted European officials to offer a military response, namely, destroy smugglers’ boats. That, they claim, will reduce both the overall numbers — 51,000 so far this year, with 1,800 drowned in the crossing — and the possibility that the boats might also carry ISIS militants. In Southeast Asia, nearly 2,000 Rohingya peoples from Myanmar were on a boat no country would let dock, and Jakarta officials ordered Indonesian fisherman not to assist. Along the US southern border, some 40,000 “border kids” are expected to attempt unauthorized entry into America. It’s a large number, but it’s one-third fewer than last summer, thanks to a US program in Central America telling young people that the trip, often on the top of trains traversing the 1,300 or more miles to Texas, isn’t worth it because they’ll be sent back. Meanwhile, politicians and activists argue about who and how many to let immigrate. Nativists howl about corruption of culture if they’re let in. Others worry that a humanitarian response, including permitting immigration or asylum, will only encourage more to come. But few are asking why so many are coming. Why are so many traveling at great risk and expense to escape Libya, Syria, Mali, Eritrea, Guatemala, El Salvador, Honduras, Mexico? Many attribute the massive exodus into the Mediterranean as a consequence of violent actors. And many do migrate to escape civil war and repression. Likewise, the so-called war on drugs in Latin America has backfired; an illegal drug culture thrives, enforced by violence. Much of the migration, however, results from unsustainable livelihoods, the disruption of traditional forms of agriculture, production, and government services that for decades provided adequate — in many cases, barely so — incomes in the developing world. The triumph of neoliberalism has changed all that. And such policies as “freeing” economies for direct foreign investment, movement of capital, deregulation, privatization, and reducing the size of the state were devised in Western capitals, London and Washington most prominently. This neoliberal experiment has produced solid growth rates in some places, but the benefits tend to accrue to elites and are not widely distributed, leading to growing inequality — a growth of 11 percent in the income gap in middle- and low-income countries from the 1990s to the late 2000s, according to a UN study. Simultaneous cutbacks in education, health care, clean water availability, and the like, make life even harder for the marginalized. The demands of a globalized economy can have multiplier effects: Lack of employment opportunities for young men in particular can aid recruiters to drug gangs or jihadist organizations. The threats such groups convey is one reason people flee. Yet a blithe narrative of free trade rules Washington and European politics, mainly due to the influence of those who benefit most — banks and energy companies, to name a couple. The downside of these policies — stubborn poverty, growing inequality, crime, and emigration — is not so apparent to those living in safety and prosperity. There’s little compassion for the victims of the globalized economy until hundreds are drowned by an overcrowded boat capsizing, or unaccompanied children appear at the border. The politicians’ harsh responses — destroying boats or deporting children — are shocking. The impoverished and violent conditions of the migrants in their homelands, however, persist. And, desperate, they won’t stay there for long.